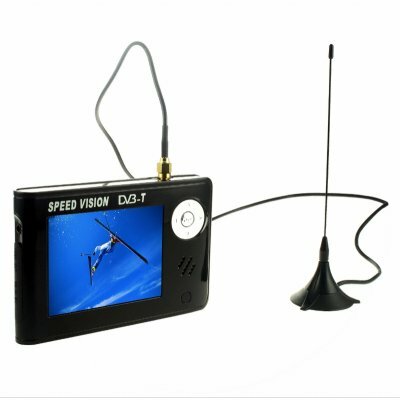 Successfully Added Handheld Digital TV Receiver - DVB-T - 3.5-inch Color Screen to your Shopping Cart. Exciting and new portable DVB-T receiver with remote control. Enjoy digital television in the palm of your hand or view and record your favourite digital programs with the supplied AV cable and an external recording device. This product is small and compact for easy importing and storage and has a simple button interface for easy use. It offers you a choice of two antennas for crisp and clear picture quality. A great whole sale import item made even better with Chinavasion no MOQ policy and blind shipping right to your door. received all items well packaged, very clear picture. I am based in UK and signal varies so you have to move it around the house or outside but eventually its good.I have not had the item long but it seems a good buy. on 2007-01-31 16:18:27 Cool gadget. A cool gadet, well made. However, where I'm based in the UK the freeview signal isn't that strong and the supplied aerials didn't do the business. When you get a picture it is an excellent one. Very sharp and very bright. Screen size could be bigger than 3,5 inch. That will be better. This digital TV is vey good. I liked it.